1. Farthing, M.J. Giardiasis. Gastroenterol. Clin. North Am. 1996, 25 (3), 493-515. 2. Lewis, D.J. ; Freedman, A.R. Giardia lamblia as an intestinal pathogen. Dig. Dis. 1992, 10 (2), 102-111. 3. Meyer, E.A. Pathology and Pathogenesis of the Intestinal Mucosal Damage in Giardiasis. In Human Parasitic Diseases, 1st Ed. ; Ferguson, A., Gillon, J., Muro, G., Eds. ; Elsevier Biochemical Press: New York, NY, 1990; 155-173. 4. CDC. Addressing Emerging Infectious Disease. Threats; US Department of Health and Human Services; Public Health Services: Atlanta, GA, 1994. 5. Seidel, J. Giardiasis. Pediatr. Rev. 1993, 14 (4), 140. 6. Adam, R.D. The biology of Giardia spp. Microbiol. Rev. 1991, 55 (4), 706-732. 7. Ortega, Y.R. ; Adam, R.D. Giardia overview and update. Clin. Infect. Dis. 1997, 25 (3), 545-550. 8. Drugs for parasitic. Lett. Drugs Ther. 1998, 40, 1-12. 9. Upcroft, J.; Upcroft, P. Drug resistance and Giardia. Parasitol. Today 1993, 9 (5), 187-193. 10. Upcroft, J.; Mitchell, R.; Chen, N.; Upcroft, P. Albendazole resistance in Giardia is correlated with cytoskeletal changes but not with a mutation at amino acid 200 in beta-tubulin. Microb. Drug Resist. 1996, 2 (3), 303-308. 11. Furness, B.W. ; Beach, M.T. ; Roberts, J.M. Giardiasis surveillance. United States, 1992-1997. MMWR, Surveill Summ. 2000, 49 (7), 1-13. 12. Weiss, J.B.; Van Keulen, H.; Nash, T.E. Classification of subgroups of Giardia lamblia based upon ribosomal RNA gene sequence using the polymerase chain reaction. Mol. Biochem. Parasitol. 1992, 54, 73-86. 13. Jimenez-Cardoso, E.; Alamillo, T.; Delgadillo, S.; Flores-Luna, A. La reaccion en cadena de la Polimerasa una alternativa en nifios con problemas diagnostico de Giardiasis. Bol. Med. Hosp. Infant Mex. 1995, 2 (10), 560-565. 14. Read, C.; Walters, J.; Robertson, I.D. ; Thompson, R.C. Correlation between genotype of Giardia duodenalis and diarrhoea. Int. J. Parasitol. 2002, 32 (2), 229 -231. 15. Bugg, R.J.; Robertson, I.D. ; Elliot, A.D.; Thompson, R.C. Gastrointestinal parasites of urban dogs in Perth, Western Australia. Vet. J. 1999, 157 (3), 295-301. 16. Van Keulen, H.; Macechko, P.T. ; Wade, S.; Schaaf, S.; Wallis, P.M.; Erlandsen, S.L. Presence of human Giardia in domestic farm and wild animals, and environmental samples suggest a zoonotic potential for giardiasis. Vet. Parasitol. 2002, 108 (2), 97-107. 17. Van Keulen, H.; Homan, W.L. ; Erlandsen, S.L. ; Jarroll, E.L. A three nucleotide signature sequence in small subunit rRNA divides human Giardia in two different genotypes. J. Eukaryot. Microbiol. 1995, 42 (4), 392-394. 18. Nash, T.E. Antigenic variation in Giardia lamblia and the host's immune response. Philos. Trans. R Soc. Lond. B Biol. Sci. 1997, 352 (1359), 1369-1375. 19. Monis, P.T. ; Mayrhofer, G.; Andrews, R.H.; Homan, W.L. ; Limper, L.; Ey, P.L. 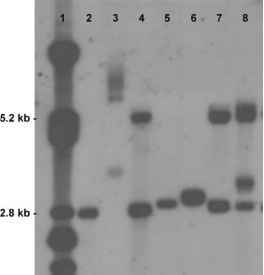 Molecular genetic analysis of Giardia intestinalis isolates at the glutamate dehydrogenase locus. Parasitology 1996, 112 (Pt1), 1-12. 20. Sambrook, J.; Fritsch, E.F.; Maniatis, T. Purification of Nucleics Acids. In Molecular Cloning a Laboratory Manual, Second Edition. ; Cold Spring Harbor. Lab. Press: 10 Skylin Drive Plain view. New York, 1987; E3 -E4. 21. Hopkins, R.M. ; Meloni, B.P. ; Groth, D.M. ; Wetherall, J.D. ; Reynoldson, J.A. ; Thompson, R.C. Ribosomal RNA sequencing reveals differences between the genotypes of Giardia isolates recovered from humans and dogs living in the same locality. J. Parasitol. 1997, 83 (1), 44-51. Thompson, R.C. Giardiasis as a re-emerging infectious disease and its zoonotic potential. Int. J. Parasitol. 2000, 30 (12-13), 1259-1267. Jimenez-Cardoso, E.; Eligio-Garcia, L. Phylogenetic Relationship Between Giardia Intestinalis. Isolates According to the Partial 16S rRNA Sequences. Proceedings of the 10th International Congress of Parasitology, Vancouver, Canada, August 4-9, Monduzzi Editore, Bologna, Italy, 2002; 581-584. 24. Garcia, L.E. ; Galvan, S.C.; Jimenez-Cardoso, E. Phyloge-netic distance between Giardia intestinalis isolates from symptomatic and asymptomatic children. Rev. Invest. Clin. 2002, 54 (2), 113-118.